Lymphoma is simply a tumor of lymphocytes. All lymphomas are malignant and have potential to cause direct and indirect, paraneoplastic clinical disease. Lymphoma is one of the most common tumors of dogs and cats and the incidence is rising in domestic companion animals as well as in people. It is estimated that it represents 7-24% of all dog tumors. The median age is 6-9 years (84/100,000 dogs 10-11yrs of age), but young dogs 1-3 yrs of age can be affected with a lower incidence (1.5/100,000 dogs). The classic origin of lymphoma is in tissues of the lymphoreticular cells of lymphoid organs such as lymph nodes, spleen, and bone marrow. Besides this distribution, lymphoid cells are widely distributed in many tissues including the gastrointestinal system, thymus and skin- all sites that primary lymphomas can arise. At times is it difficult to determine a primary site and this common condition is called multicentric lymphoma. Tissues that are typically devoid of a resident lymphocyte population can also be less common sites for lymphoma including the eye, brain, spinal cord, liver and lung. Even though all lymphomas are malignant, we have recognized that not all lymphomas behave biologically similar. Historically, we have had little means to assess and account for the inherent differences in our animal patients and efforts have been directed on identifying subtypes within lymphomas to assist in predicting their behavior. Lymphomas can be subtyped clinically by staging with is prognostic for biological behavior and assists in selection of treatment options. Staging is essential after a diagnosis of lymphoma has been established. Staging determines the extent of disease in the patient and thus indirectly assesses the biological aggressiveness of the lymphoma. Molecular testing and histopathology play a minimal role in clinical staging. The diagnosis of lymphoma might seem straightforward and probably for years was considered more didactic, but as our understanding of the immune system expanded so did our understanding of its benign/reactive and malignant forms. We no longer just have large and small lymphocytes, but we now have B and T lymphocytes and each of these has subtypes with specific and interacting roles. Each of these can be the lymphocyte source for a subtype of lymphoma with distinct biological behavior and distinct response to a myriad of treatments. Things just got very complicated- and exciting. In surgical pathology, lymphoma has always been on the forefront in application of basic science to clinical diagnosis and treatment. It remains in that role today. The development of a large assortment of commercially available antibodies that can react to lymphocyte types and differentiation antigens and their application to the expanding array of diagnostic techniques including immunohistochemistry, immunocytochemistry and flow cytometry has created an explosion in our ability to identify many different lymphocyte subtypes and thus their malignant counterparts. The automation of these techniques has made these techniques available even in small diagnostic laboratories, but granted information is only as good as the specialist who interprets that information. Traditionally, lymphomas were subtyped strictly by histological criteria that included cell size, nuclear shape and the mitotic rate. 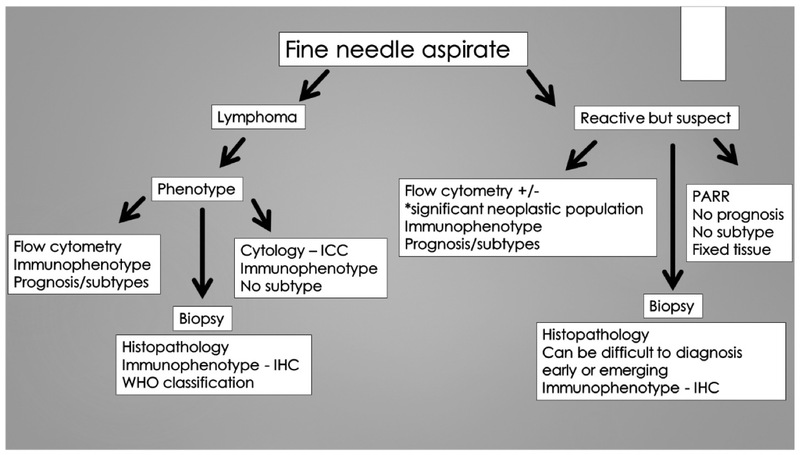 These criteria and their assessment were the basis for the original WHO lymphoma classification (i.e. low grade small cleaved lymphoma or high grade round cell lymphoma). These histological based subtypes were then used to imply the biological behavior of the lymphoma, but with only inconsistent and variable success. With time and the addition of early advanced diagnostics (IHC= immunophenotyping for T or B cell type), we knew that dogs typically get non-Hodgkin’s lymphoma and that B cell lymphoma had a better prognosis for treatment response than T cell lymphoma. Limited chemotherapeutic protocols often still resulted in similar treatment regardless of the classification. Our newly emerging understanding of lymphocytes and the immunolymphatic system, newly accessible molecular diagnostics and improved patient monitoring and testing has resulted in a new wave of classification and has been the early advent of personalized medicine. The WHO Revised classification flipped the template, identifying individual clinical entities and then defining those with the help of histopathology, immunological, cytogenetic and molecular techniques. The use of ancillary molecular techniques also allows more accurate and consistent diagnosis. This has resulted in our understanding that different lymphoma subtypes can be traced back to their normal nodal counterparts and that the molecular alterations can predict how they will behave and potentially respond to treatment. This new classification has been applied successfully in the dog (cat and horse) and has demonstrated to be more consistently prognostic. This also demonstrates the utility of the dog as the premier animal model for human lymphoma disease. While over 50 subtypes have been identified in human medicine, the markers and cytogenetics in our animal species lags and we are more limited in our abilities to recognize this array of lymphoma types. Current diagnostic tools for diagnosis of lymphoma include noninvasive techniques of cytology, Flow cytometry and PARR (PCR for antigen receptor rearrangement) and the more invasive technique of histopathology following biopsy. Each can give specific types of information, has limitations and indications for use. Information gleaned from the combination of these diagnostic tests allows lymphomas to be subtyped and often gives more specific prognostic information to guide owner decisions and treatment choices. All cases present differently and have inherent differences due to patient and client particulars, thus no rigid protocol can be stated that addresses all cases of lymphoma. While these particulars exist, there are some basic guidelines for the utility of these diagnostic tests that are based off the test’s benefits and limitations. When in question, a call to a diagnostician that is well versed in lymphoma is a good investment in time. Seelig D, Avery A, Ehrhart E and Linden M. The Comparative Diagnostic Features of Canine and Human Lymphoma. Veterinary Sciences. 2016; 3(2): 11. Valli VE, Kass PH, San Myint M and Scott F. Canine lymphomas: association of classification type, disease stage, tumor subtype, mitotic rate, and treatment with survival. Vet Pathol. 2013; 50(5): 738-48. Ponce F, Marchal T, Magnol JP, Turinelli V, Ledieu D, Bonnefont C, Pastor M, Delignette ML and Fournel-Fleury C. A morphological study of 608 cases of canine malignant lymphoma in France with a focus on comparative similarities between canine and human lymphoma morphology. Vet Pathol. 2010; 47(3): 414-33. Avery PR, Burton J, Bromberek JL, Seelig DM, Elmslie R, Correa S, Ehrhart EJ, Morley PS and Avery AC. Flow cytometric characterization and clinical outcome of CD4+ T-cell lymphoma in dogs: 67 cases. J Vet Intern Med. 2014; 28(2): 538-46. Lurie DM, Milner RJ, Suter SE and Vernau W. Immunophenotypic and cytomorphologic subclassification of T-cell lymphoma in the boxer breed. Vet Immunol Immunopathol. 2008; 125(1-2): 102-10. Valli VE, San Myint M, Barthel A, Bienzle D, Caswell J, Colbatzky F, Durham A, Ehrhart EJ, Johnson Y, Jones C, Kiupel M, Labelle P, Lester S, Miller M, Moore P, Moroff S, Roccabianca P, Ramos-Vara J, Ross A, Scase T, Tvedten H and Vernau W. Classification of canine malignant lymphomas according to the World Health Organization criteria. Vet Pathol. 2011; 48(1): 198-211. Seelig DM, Avery P, Webb T, Yoshimoto J, Bromberek J, Ehrhart EJ and Avery AC. Canine T-zone lymphoma: unique immunophenotypic features, outcome, and population characteristics. J Vet Intern Med. 2014; 28(3): 878-86. Flood-Knapik KE, Durham AC, Gregor TP, Sánchez MD, Durney ME and Sorenmo KU. Clinical, histopathological and immunohistochemical characterization of canine indolent lymphoma. Vet Comp Oncol. 2013; 11(4): 272-86. Williams MJ, Avery AC, Lana SE, Hillers KR, Bachand AM and Avery PR. Canine lymphoproliferative disease characterized by lymphocytosis: immunophenotypic markers of prognosis. J Vet Intern Med. 2008; 22(3): 596-601. Bromberek JL, Rout ED, Agnew MR, Yoshimoto J, Morley PS and Avery AC. Breed Distribution and Clinical Characteristics of B Cell Chronic Lymphocytic Leukemia in Dogs. J Vet Intern Med. 2016; 30(1): 215-22. Dr. EJ Ehrhart received his DVM degree from theUniversity of Missouri-Columbia. After four years in private practice, he completed his veterinary anatomic pathology residency and PhD degree at Colorado State University. His doctoral degree involved advanced pathology training focused on medical and radiation oncology. 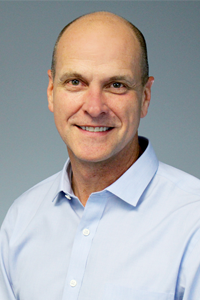 Dr. Ehrhart is board-certified in anatomic pathology by the ACVP. He worked as a diagnostic pathologist at the University of Illinois and then joined the faculty at Colorado State University. During his 15 years at CSU, he became a full professor, worked as a senior veterinary diagnostic pathologist, was coordinator of the CSU diagnostic residency programs and oversaw the Molecular Pathology core at the prestigious CSU Animal Cancer Center. Dr. Ehrhart has strong interest and expertise in oncologic and ocular pathology. He is a widely recognized oncologic pathologist with a focus on specialized molecular testing. His work has been extensively published in the oncologic pathology literature and he has been an active contributor in many clinical trials.